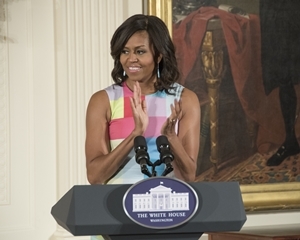 Washington, DC – This morning, First Lady Michelle Obama joined the Institute of Museum and Library Services Acting Director Maura Marx to present the 2015 National Medal for Museum and Library Service. Ten institutions from across the country attended the White House Ceremony to be recognized for outstanding service to their communities. The First Lady presented the National Medal to the museum and library directors and to community members from each institution, who shared how the library or museum has impacted their lives. These ten honorees exemplify the nation’s great libraries and museums and demonstrate significant impact and high quality of programs, services, and partnerships, exceeding the expected levels of community outreach. They were selected from thirty finalists that were among institutions from across the country that were nominated for the honor. A video produced for IMLS by HISTORY that honors the winners was also shown at the ceremony. These ten honorees exemplify the nation’s great libraries and museums and demonstrate significant impact and high quality of programs, services, and partnerships, exceeding the expected levels of community outreach. They were selected from thirty finalists that were among institutions from across the country that were nominated for the honor. Later this year, StoryCorps—a national nonprofit dedicated to recording, preserving, and sharing the stories of Americans—will visit the recipient institutions to document stories from the community. The next deadline for nominating a museum or library is October 1, 2015. Learn more about the National Medal at www.imls.gov/medals. The Institute of Museum and Library Services is the primary source of federal support for the nation’s123,000 libraries and 35,000 museums. Our mission is to inspire libraries and museums to advance innovation, lifelong learning, and cultural and civic engagement. Our grant making, policy development, and research help libraries and museums deliver valuable services that make it possible for communities and individuals to thrive. To learn more, visit www.imls.gov and follow us on Facebook and Twitter.